The newly designed IKA IKAMAG RET Basic Safety hotplate stirrer has a 50-1700rpm wide operation range and can heat up to (50 - 380 °C). Suitable for unsupervised operation. IKA RET Control Stainless Steel Magnetic Stirrer Part No:5020001. The IKA RET is designed by IKA engineers with a large TFT display that can give many data such as temperature, weight and the PH Level in the media being stirred. IKA RET Control Ceramic Glass Magnetic Stirrer Part No:5030001. The IKA RET Control hotplate stirrer designed by IKA engineers with a large TFT display that can give many data such as temperature, weight and the PH Level in the media being stirred. The new IKA C-MAG Digital series magnetic hotplates. Comes in 4, 7 and 10" ceramic platform sizes. The LCD display C-MAG Digital also includes the PT1000 temperature sensor when ordered. The new IKA C-MAG Digital series magnetic hotplates. Comes in 4, 7 and 10" ceramic platform sizes. The LCD display C-MAG Digital also includes the PT1000 temperature sensor. IKA RH Digital is the digital version of the IKA RH Basic which has also joined to the IKA family of laboratory products recently. The IKA RH Digital has a stirring capacity of 15l at a 100-2000rpm variable speed. 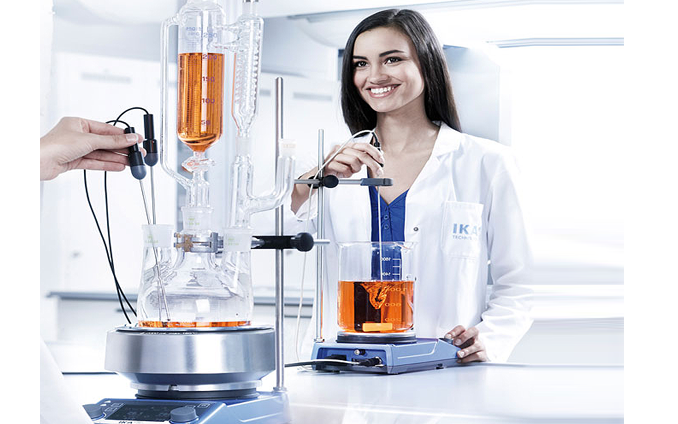 IKA RT5 Power is a 5 station magnetic hotplate stirrer that can heat and mix 5 flasks at a speed of 0-1100rpm. Each station can heat and stir upto 0.4l of medium total of 2 liters. These multiposition stirring hot plates are designed for synchronous stirring. They feature magnetic-coil technology that provides noiseless and consistent stirring on all positions. IKA RT5 Power is a 5 station magnetic hotplate stirrer that can heat and mix 5 flasks at a speed of 0-1100rpm. Each station can heat and stir upto 0.4l of medium total of 4 liters. IKA RT15 Power is a 15 station magnetic hotplate stirrer that can heat and mix 15 flasks at a speed of 0-1100rpm. Each station can heat and stir upto 0.4l of medium total of 6 liters. The RO 5 Digital is a new product from IKA that replaces the old model IKA RO 5 Control. The IKA RO 5 is a 5 station magnetic stirrer with full digital control integrated with an LED dsiplay. The RO 10 Digital is a new product from IKA that replaces the old model IKA RO 10 Control. The IKA RO 10 is a 10 station magnetic stirrer with full digital control integrated with an LED dsiplay. The RO 15 Digital is a new product from IKA that replaces the old model IKA RO 15 Control. The IKA RO15 is a 15 station magnetic stirrer with full digital control integrated with an LED display. IKA IKAMAG Color Squid Magnetic Stirrers. Available in 10 different designs. They have a 1 liter stirring capacity at a variable speed of 0-2500rpm. IKA IKAMAG Big Squid Magnetic Stirrers. Available in 5 different designs. They have a 1.5 liter stirring capacity at a variable speed of 0-2500rpm. IKA IKAMAG Lab Disc flat magnetic stirrer. Extremely convenient with its slight flat design and portable size and weight. For better mixing tasks, the lab disc can also reverse direction of rotation automatically every 30 seconds. IKA C-MAG MS4 is a 4" x 4" magnetic stirrer that comes with a ceramic glass platform. It has a 100-1500rpm variable speed and 5 liter (H2O) stirring capacity. IKA Topolino Portable Magnetic Stirrer, Compact Size. 250ml Stirring Capacity at 300-1800rpm variable speed. Ideal for small stirring tasks. Affordable price and good quality. IKA Topolino Portable Magnetic Stirrer, Battery Powered, Part No:3381301 250ml Stirring Capacity at 300-1800rpm. It's battery operated 4x(AA) or 100~240V with the DC charger that it comes with. IKA Mini MR Standard portable magnetic stirrer. 2500 rpm Variable speed. 1 liter (1,000ml) maximum stirring capacity. Durable, compact and efficient stirring with universal voltage support.